Many banks consider themselves to be leaders when it comes to digital but what is the reality? All banks have been forced to invest in digital capabilities but they have developed to a different degree. What has been lacking until now is objective data. That’s where the Deloitte Digital Banking Maturity project comes in, providing information on the position of each bank with respect to its digital offering, comparing apples to apples by taking into account the full spectrum of products and functionalities, mapped against consumer preferences in each market. 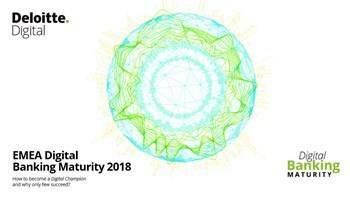 The Deloitte Digital Banking Maturity project, a joint effort of Deloitte member firms across EMEA, is a comprehensive and objective assessment of financial institutions’ digital maturity in three critical areas. A functionality review was conducted of 248 financial institutions across 38 countries. A team of 136 “mystery shoppers” opened current accounts and evaluated each bank’s internet and mobile banking channels to map their offering against 826 functionalities. In parallel, a customer survey was conducted, of more than 8,000 clients of banks in the same 38 countries, to understand customer needs and preferences for each market, and to be able to map each bank’s functionality against consumer expectation in their market. These were supplemented by an evaluation of mobile user experience (UX) by customers according to the User Experience Questionnaire (UEQ) framework.